Last year the kids and I made a really fun gift for my husband for Father’s Day. I wanted to give him something meaningful that he would actually use, but also something my kids could participate in. 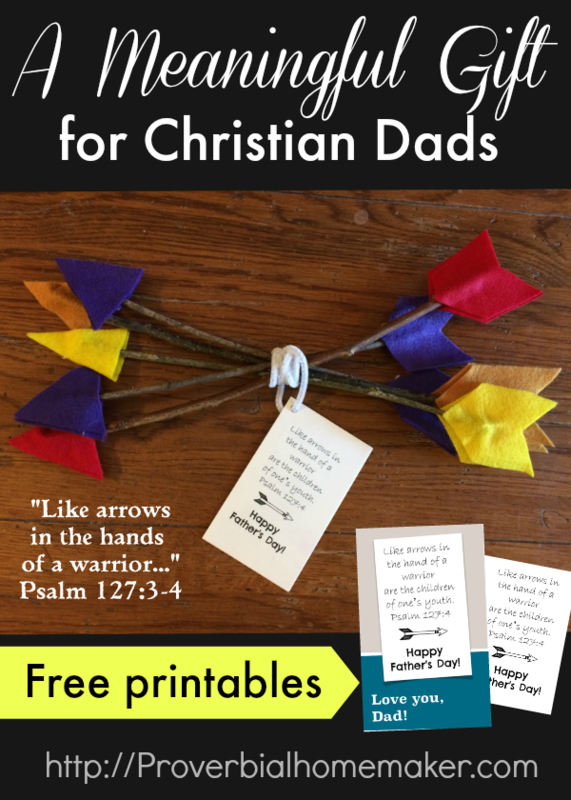 I’ve been waiting a WHOLE YEAR to share this with you, although you certainly can use this gift idea anytime you are celebrating the dads in your life. My husband loves being a father. He talks about his family and our children with such pride and yet overwhelming gratitude and humility. What’s more, he’s incredibly good at being a dad! 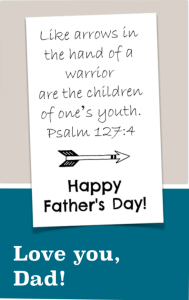 God has given him a special father’s heart that has the utmost delight in his children. He often talks about how much of a blessing and heritage children are, and how important it is in his mind to raise them to know and love the Lord. Nothing matters more to him than pointing me and his children to Christ. That’s right, I married well! 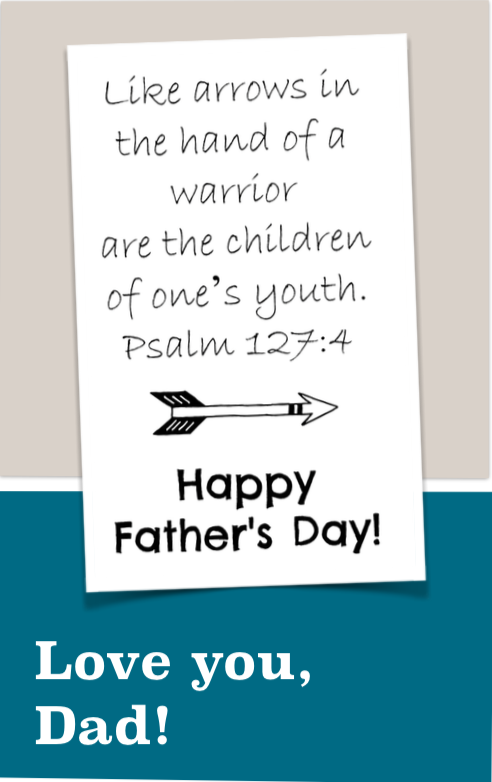 So for Father’s day last year, we gave him a wonderful gift inspired by Psalm 127:4. The kids spent some time gathering sticks to make their dad some arrows. We had another family with us for art day, so this ended up being the class activity. We cut out pieces of colorful felt for the arrow heads as well as the fletching (I believe that’s what you call the “feather” part at the other end). 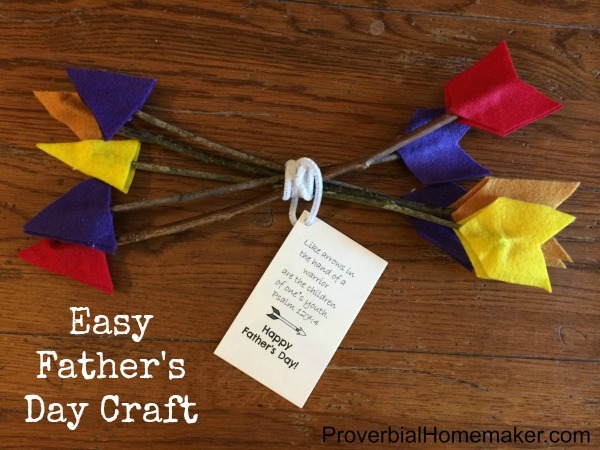 The kids used a hot glue gun to paste the felt on both sides of the sticks and make arrows. We made one arrow for each kid and bundled them into groups by families. Then we tied these cute tags onto them and presented them to the daddies as gifts on Father’s Day. Download a PDF of the tags here. Just cut them out and hole punch them, tying them on with pipe cleaners, ribbon, yarn, or twine. 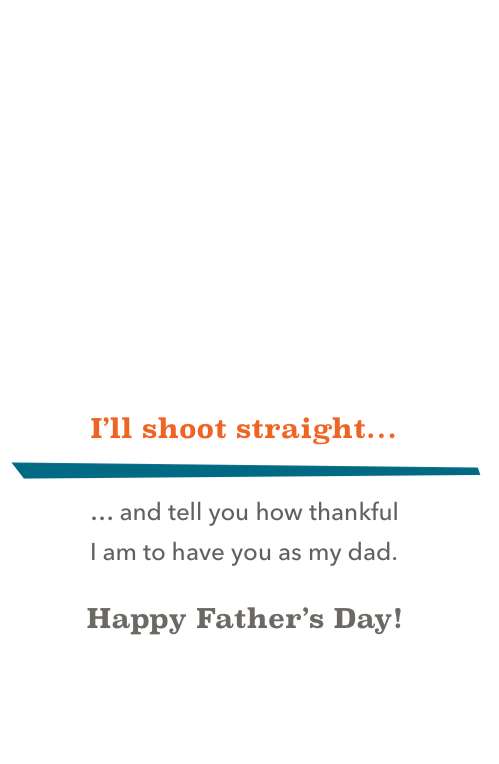 You can also give a Father’s Day card that uses the same image. I made a PDF of the card for you to download. Print double-sided on card stock and fold along the center. Or you can print on one side and write your own message in the middle. 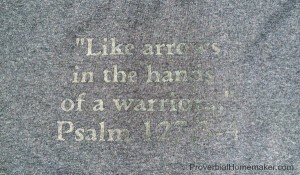 Inspired by this great t-shirt design by Janine at True Aim, I ordered a similar one for my husband from Cafe Press. They usually have discounts just before Father’s Day, so look for those. If you’d like to design a similar t-shirt, you can download the single arrow and the multiple arrow images that I used to make it easier. You could modify the multiple arrow image so that it matches the number of kids in your family. You can also just download the graphics I used for the front and the back and upload them to Cafe Press when you design the t-shirt or anything else you want to customize. 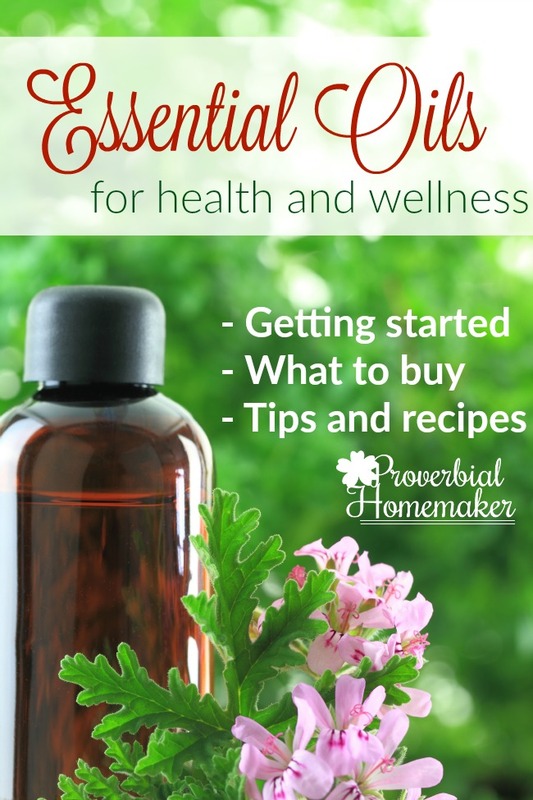 I hope you find these freebies and ideas helpful! All together, this made a really meaningful gift, and now a year later my husband STILL wears that t-shirt! 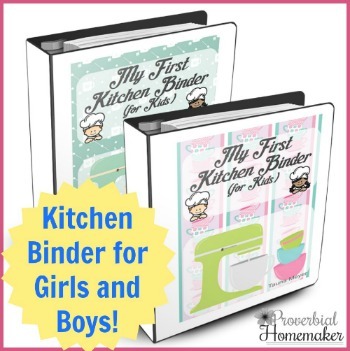 I totally love this idea for a gift for dad’s! It would be super easy to put together and so meaningful! Thank you for the idea! Oh my goodness this is so cute! My husband often qoutes this verse and talks about it. I’m going to make this for him for father’s day this year with our son. he’s going to love it! Oh by the way I saw your post on Mom 2 Mom link up. Love this! Pinning for later. Hi Tauna, I just wanted to thank you for posting this! 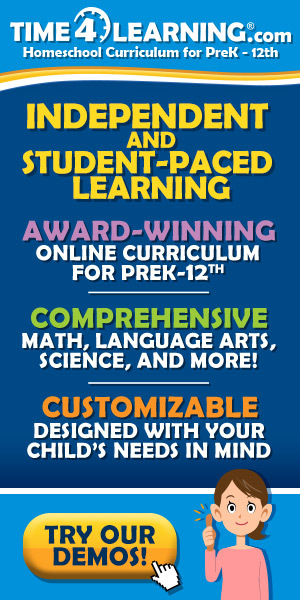 I use so many of your resources for homeschooling my kiddos, especially the bible studies I can use for their different ages. 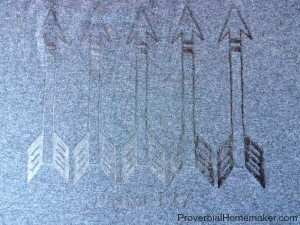 And I made my husband a shirt, and my girls made arrows for Father’s Day. He really enjoyed his gift! We quote this verse often to our friends when they tease us about our family size–we have a total of 6 kids (“his” and “ours”), and of course enjoy our family size. 🙂 So thank you for sharing such a meaningful way to acknowledge my husband, his faith, and his love for his children!! Oh I am so glad to hear that! Thank you so much for letting me know! I actually got my husband another of the same shirt this year because the last one was starting to fade. 🙂 Hope you all had a wonderful Father’s Day! My Husband will really like these, too–thank you so much! !